This morning Jen woke up and had to ride out the remaining time she spent with her good friend, Mr. Magnesium Drip. By late morning she was done and after more than twenty-four hours she was finally able to go visit the guys in the NICU. Needless to say she was pleased by this turn of events. Even after eating nothing but ice chips for the past two days she was all smiles with the boys. However, after she was done with the magnesium the nurses told her she'd be able to upgrade to clear liquids for today. 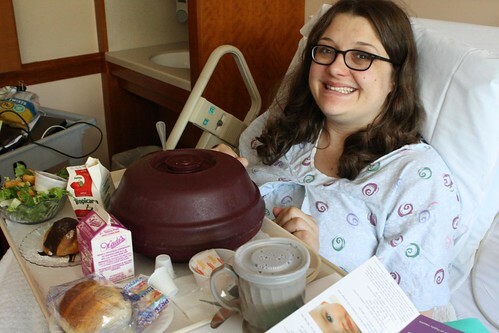 Her first cranberry juice, in concert with the removal of her IV, catheter, and fashionable inflatable pants, she was feeling on top of the world. She also graduated from Labor & Delivery to the Postpartum area of the hospital. In her new room there was a special treat for her. 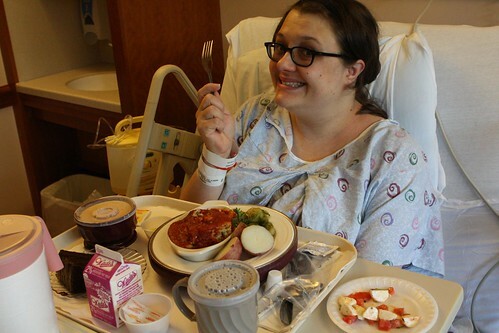 We thought it was a mistake at first but apparently Jen was recovering so well that she was allowed to skip the day of clear liquids and dive into a hot lunch. This made her almost as happy as the visit to the NICU. I, on the other hand, spent the entirety of her dining experience wondering how it was possible that they could find a way to make a dinner roll that included so many ingredients. 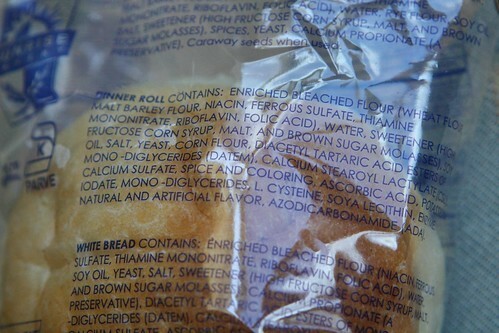 You would figure after adding this many chemicals to a simpler dinner roll that the plastic pouch would be rendered unnecessary. After lunch Nana and Grandpa came to visit and unexpectedly got a chance to hold the babies straight out of their incubators. We'd thought they wouldn't have a chance until the babies came home but I was able to pull some strings with the nurses. After Jen fed the babies again I had to take off back home and pick up the farm share. Most of this was probably just going to rot in our fridge but I figured I would be ambitious and hold out hope that I'd be able to make a few dinners later on in the week. I had hoped to use up the rest of last week's share on Saturday and Sunday so at this point our fridge at home is pretty well stocked with greens. 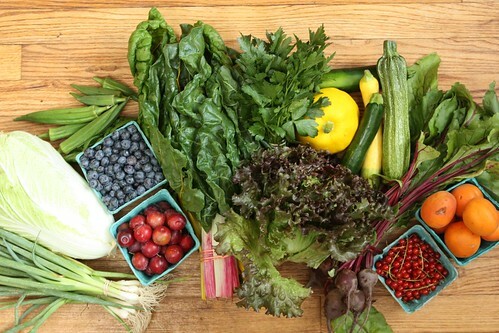 This week we got a bunch of Bright Lights Swiss Chard, a head of red leaf lettuce, a head of Napa Cabbage, a bunch of scallions, a bunch of Baby Red Ace Beets with Greens, two pounds of summer squash, a basket of red lake currants, a bunch of parsley, a hand full of okra, a basket of blueberries, a basket of apricots, and bunch of sugar plums. The apricots were cosmetically damaged by the hail storm we had last week but we were promised that they were delicious nonetheless. After feeding the babies again Jen was fortunate enough to have a nice full meal. I was fortunate enough for her to have a small appetite and get to eat the rest of the leftovers. 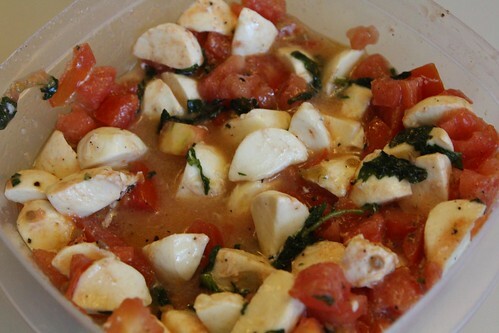 While at home I was able to make a quick tomato and mozzarella salad with the Jersey Tomatoes and Lioni Mozzarella I had been hoping to use on Saturday. I didn't realize she was going to have lasagna and tomato soup for dinner or I may have diversified a bit. At any rate I prevented another tomato from dying a slow death on our counter. And let's face it, that's a top priority these days. Today, as a conclusion to our first full day of being parents, we are going to be making frequent all-night visits to the NICU to feed the guys and be with them. In the interim we may even watch today's stage of the Tour de France. See? Being a parent is easy! I even had time to make a quick snack for Jen and write a blog entry! This is going to be a piece of cake! The nurses come with the babies, right? Labels: babies, Local, parenting, What'd we get?